This article is about the Finnish broadcast station. For the American cable channel, see MTV Tres. For the Finnish version of MTV, see MTV Finland. The MTV3 broadcasting studio in Ilmala, Helsinki. MTV3 (Finnish: MTV Kolme; Swedish: MTV Tre) is a Finnish commercial television station owned by Bonnier. It had the biggest audience share of all Finnish TV channels until Finnish Broadcasting Company’s Yle TV1 took the lead. The letters MTV stand for Mainos-TV ("Commercial Television"), due to the channel carrying advertising for revenue. Number 3 was added later, when the channel was allocated the third nationwide television channel and it generally became known as "Channel Three" – Finnish Broadcasting Company’s Yle TV1 and Yle TV2 being the first two – and also to distinguishing it from the later MTV Finland. The channel's logo was a stylized owl, changed to an owl's eye after an image renewal in 2001. MTV3 currently has about 500 employees. It is also known as Maikkari (a slang of word "Mainos-TV"). MTV3 started on 13 August 1957, the first commercial television network in Finland, and one of the earliest nationwide commercial TV stations in Europe. In Finland it was preceded by the regional TES-TV commercial channel. It was originally known as MTV with programmes broadcast on the two channels of Yle. MTV was allocated its own channel after 1986, when Kolmoskanava (TV3) was born as a joint venture between Yle, MTV, and Nokia. 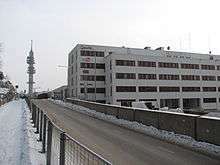 MTV3 was born in 1993 when MTV took over the shares of TV3 from Yle and Nokia and MTV programming switched from the Yle frequencies to the TV3 transmitters. The same year MTV Oy was admitted as a full active member of the European Broadcasting Union. In 2005 Alma Media sold MTV3 and its sister channels (MTV3+, Subtv, Radio Nova and a share in Urheilukanava) to Swedish Bonnier. MTV3 broadcasts everyday from morning to small hours. The pre-dawn hours are allocated to a SMS-based online chat. Much of the output of MTV3 is a mixture of Finnish versions of popular program formats and of American and British imports. However, MTV3 has also its own Finnish programming. For example, many of Spede Pasanen's productions were produced for MTV3. MTV3 broadcasts two main news broadcasts every day on prime time. Seitsemän uutiset at 19:00 EET and Kymmenen uutiset at 22:00 EET. MTV3 also broadcast news every morning and short bulletins at 21:00 EET. MTV3 brought the first daily soap opera to Finland, by showing the American The Bold and the Beautiful, which in 1990s became the most popular show on the channel. In 1999, MTV3 started showing Finnish daily soap opera Salatut elämät. Antero Mertaranta - Commentator, he commentary every Finnish hockey team game. Oskari Saari - Provides race commentary for live broadcasts. Matti Kyllönen has previously provided commentary for the hour-long race summary shown on MTV3. Erkki Mustakari - Reporter and interviewer as well as occasional co-commentator with Saari (such as replacing Jyrki Järvilehto in 2010). Timo Pulkkinen - On-track reporter and interviewer for races. Also occasional commentator for Friday practice sessions. Mika Salo - Saari's new co-commentator in 2011. ↑ "Results From The TV Audience Measurement". Finnpanel Oy. Retrieved 13 January 2015. ↑ "Historia". www.almamedia.fi. Retrieved 2015-09-11. ↑ "MTV:n toiminta Suomessa alkaa". www.urhoklubi.net. Retrieved 2015-09-10. ↑ "Bonnier and Proventus to Acquire the Finnish Broadcaster MTV3 - Deal IQ". Retrieved 2015-09-10. ↑ "MTV Yritys - programming". www.mtv.fi. Retrieved 2015-09-11. ↑ "Uutiset". mtv.fi. Retrieved 2015-09-11.